So here at NABS we talk to over 20 people a day around the USA interested in either playing or starting a bubble football league in their area. Oftentimes, the questions are always the same, so we figured we’d take some time to answer some FAQ’s about our Bubble football Leagues, the game play, and the Bubble football Equipment. The risks associated to Bubble Football or Bubble football are the same as any other sport. There’s always a risk for injuries such as twisted ankles or bruised knees, but the risk isn’t really any higher than traditional football. There is more of a concern that the actual contact causes injury, but because the bubbles are so big, the concussive impact is actually displaced over the entire surface of the ball, so the player inside feels nothing! As far as concussive related injuries are concerned, we’ve never had any. The game is played just like a traditional football game with two halves, anywhere from 25-45 minutes per half. Teams play in team sizes ranging from 6-on-6 to full 11-on-11 football matches. It all depends on the type of terrain the game is being played on, the size of the facility, and the number of players in a particular league. The only difference between traditional football and bubble football is that sometimes players can’t get upright after being knocked down because of their laughter. It’s not uncommon for the referees to have to help them roll over to get up! Is there a difference in quality of the bubble football bumpers? Yes! 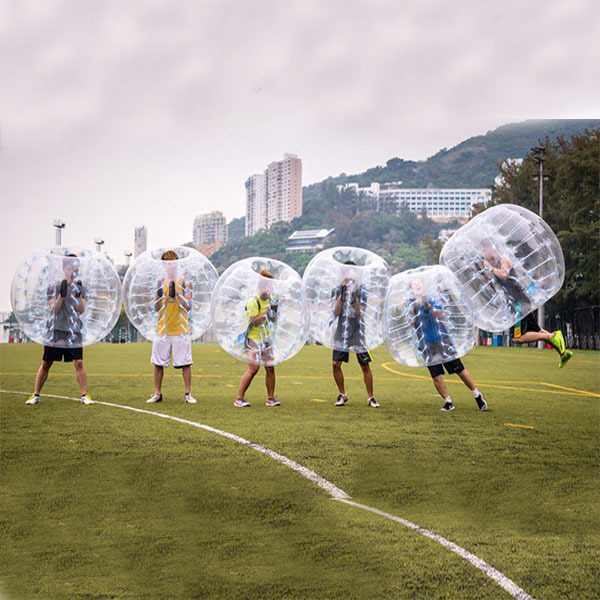 As with anything else, there is a marked difference in high quality and low quality bumpers balls for bubble football that is associated to two aspects of construction: the plastic resin used and the manufacturing process. Many people assume that €plastic is plastic€ so any type will do, however it’s not the case. Oftentimes you may have seen videos of bubble football where the balls appear somewhat cloudy. The reason why is because lesser quality balls use a blend of plastics in their resin which can affect how light, temperature, and overall use will cause the ball to wear over time. Not only that, even more important is the type sealing used on the ball’s seams. If the seams are just heat sealed as opposed to ultrasonically welded, you’re going to have a huge difference in the durability of those seams. That’s why all our equipment is inspected for approval twice before we send anything out.